Rapid Drug Detox can help detox you from Opiates. Opiates are highly potent, powerful drugs derived from the poppy plant. They are also known as narcotics. Opiates have been used for many centuries to relieve pain. Opiates can be natural or synthetic and are highly addictive when compared to other substances; physical and psychological dependences develop very rapidly. The detox process is difficult for opiate addiction, particularly if undergone without the help of trained professionals. Call us at 1-888-825-1020 or contact us to learn more about how we can help you overcome opiate addiction. Opiate withdrawal can be a painful process, particularly after heavy use. Symptoms typically begin within a day of discontinuing use and include profuse sweating, malaise, mood disturbances including irritability and thoughts of suicide, chills, muscle aches, insomnia, vomiting, abdominal cramps, weakness, shivering or trembling, yawning, convulsions, dehydration, diarrhea, leg kicking and severe anxiety. Symptoms are heightened when opiates are discontinued without the help of a medical detox. The withdrawal symptoms associated with opiate addiction are usually experienced shortly before the time of the next scheduled dose of the drug, sometimes within as early as a few hours (usually between 6-12 hours) after the last administration. Early symptoms include: watery eyes, insomnia, diarrhea, runny nose, yawning, dysphoria, sweating and in some cases a strong drug craving. Restlessness, irritability, loss of appetite, body aches, severe abdominal pain, nausea and vomiting, tremors, and even stronger and more intense drug cravings appear as the syndrome progresses. Severe depression and vomiting are very common. The heart rate and blood pressure are elevated and can lead to a heart attack, blood clot or stroke. Chills or cold flashes with goose bumps (“cold turkey”) alternating with flushing (hot flashes), kicking movements of the legs (“kicking the habit” – similar to restless leg syndrome) and excessive sweating are also characteristic symptoms. Severe pains in the bones and muscles of the back and extremities occur, as do muscle spasms. At any point during this process, a suitable narcotic can be administered that dramatically reverses the withdrawal symptoms. Major withdrawal symptoms peak between 48 and 96 hours after the last dose and subside after about 10 to 12 days. Sudden withdrawal by heavily dependent users who are in poor health can be fatal. 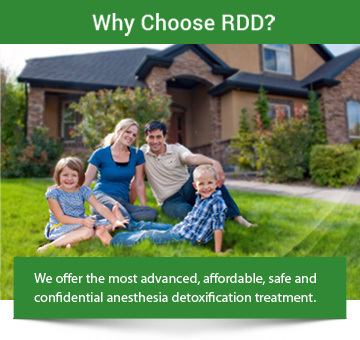 The RDD Method™ for opiate detoxification under anesthesia is a medical procedure that eliminates most of the withdrawal symptoms. During the procedure the patient is given medication to relax and then put under light, general anesthesia for about an hour. Following the procedure, recovery begins under direct medical supervision. The patient’s vital signs and overall physical and mental reactions to these medications are closely monitored during the detox procedure. In the days that follow, the patient often sleeps more than usual. Administered by professionals as part of a long-term drug-addiction recovery strategy, The RDD Method™ is significantly more effective than other courses of opiate addiction treatment. How do I know if I am addicted to opiates? Short-term users may require a detox program in order to successfully discontinue use of the drug because of opiates very addictive traits. Addicts typically require higher doses of the drug and experience cravings for opiates between doses. The detox process for opiates varies in length depending on the pattern of typical use and on individual differences. The most severe withdrawal symptoms occur during the first several days after discontinuing use of the drug making it important to seek immediate professional help from trained opiate detox professionals. Is opiate addiction recovery painful? While recovery from opiate addiction can be painful; the right procedure greatly reduces discomfort. Anesthesia opiate detox is a procedure that is effective at reducing the pain normally associated with opiate detox. How do I choose an opiate detox program? We never use other replacement addicting opiates, often prescribed by physicians and detox centers, such as Suboxone®/Subutex (Buprenorphine) or injectable Buprenorphine. These schedule III controlled opiate drugs are routinely and widely used and approved by the FDA for opiate addiction maintenance, like Methadone. Many patients find themselves in the same situation as they were before drug treatment from a doctor or a drug rehabilitation center. Some in-patient rehab centers also use schedule II controlled liquid Hydrocodone and Dilaudid “cocktails”. Patients soon realize these replacement drugs cause severe withdrawal once they are discharged from these programs. This causes the patient to seek opiates for relief from the severe discomfort of a Buprenorphine withdrawal. The use of these drugs for treatment of opiate addiction is merely switching one opiate drug for another setting the patient up for failure. This does not solve the patient’s drug addiction problem. As use of these drugs become more common, we are seeing a steady increase of requests for an anesthesia detox from patients addicted to Suboxone®/Subutex (Buprenorphine). With RDD’s Naltrexone Therapy used as a pellet/implant, injectable “IM” shot or the oral pill form, the patient stays clean and cravings are greatly reduced or eliminated.